We are currently in our Spring 2019 Lesson Study Cycle. ​fill out the short survey at the bottom of this page. What does participation in a Lesson Study Experience look like? ​Cost is $35 per individual. Travel to and from the Research Lesson will be the responsibility of the participants or their district. - A single detailed lesson plan and sketched out unit plan that can be used in each of the teacher’s classroom. Lesson Study is a highly effective form of professional learning. In order to make Lesson Study more accessible to Illinois educators, the content specialists have modified the process slightly so that it can be facilitated mainly virtually. 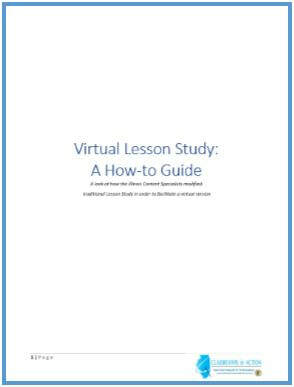 Read about our pilot experience and learn more about the benefits of lesson study in our "Virtual Lesson Study: A How-to Guide​" document. 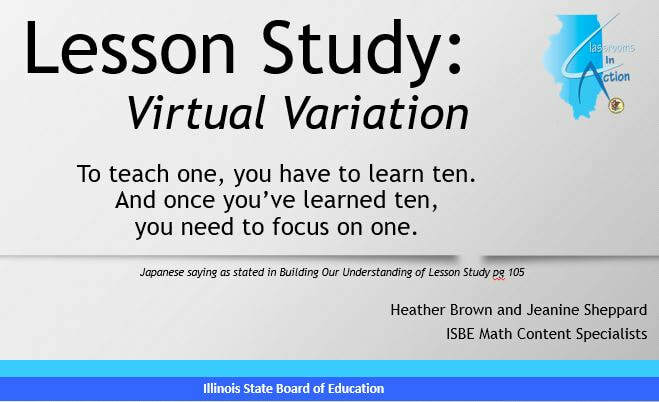 Lesson Study: Virtual Variation is a session we designed and deliver to share what we have learned and experienced through lesson study in Illinois. This session looks at what lesson study is (and is not), explores the benefits of lesson study, shares the results of our pilot lesson study, and discusses next steps for districts interested in facilitating a lesson study. Access all of the research lessons Illinois educators have created during their lesson study experiences. Interested in participating in a math lesson study? We would like to know what part of the state you are from in order to put you on the best team.